German chocolate cake is actually not German at all. The recipe using Baker’s German’s Sweet Chocolate was first published in a Texas newspaper in the 1950s, although similar cakes had been popular in the South for many years. General Foods, which owned the Baker’s Chocolate brand, capitalized on the cake’s popularity and sent photos and the recipe to newspapers all across the country. The cake was so popular that sales for the sweet chocolate jumped 73% in just one year. After last year’s “experiment” with Black Forest Cake, I wasn’t so sure that Michael would let me make another birthday cake for him. But he is a kind soul and quite forgiving of my experiments and he agreed to play guinea pig again this year, this time with a new German chocolate cake recipe. I searched around for several months reading many recipes until I ran across this one on Epicurious. The photo made me want to reach through the screen and help myself to a slice, and I knew that I had to try it. The traditional coconut-pecan topping has been moved to the middle and is made with a dulce de leche base. Then the dark chocolate cake is covered with chocolate ganache. The combination is sheer decadence. Added a pinch of sea salt to the dulce de leche. Some commenters complained that making the dulce de leche was difficult because they didn’t have a pan large enough to hold a 9-inch deep dish pie pan. I simply used a large roasting pan for the water bath and it worked great. Others suggested doing the boiling water method, in which you put the unopened can into boiling water on the stove for a couple hours. I know some people swear by this method, but I remember at least one commenter saying that her cans literally exploded when she tried this. Of course she didn’t say how old the cans were or what condition they were in, but in any case, her experience is a cautionary tale. Making the cake was not difficult, it just required a few steps, but it was all worth it when we tasted it. We had some friends over to share the birthday cake, and they all said it was very rich and delicious, and one even said it was the best cake she had ever had. The dark chocolate plays well against the sweet dulce de leche, but it is indeed rich, so I recommend cutting small slices. The recipe says it serves 12, but we got 16 pieces out of it and agreed that each slice was an adequate portion. Because the ganache is soft, keep the cake in the refrigerator; that is, if there is any left! CAKE: Preheat the oven to 350°F. Set racks in the upper and lower thirds of the oven. In the medium bowl, sift together sugar, flour, cocoa powder, baking powder, baking soda, and salt into a large bowl. In the bowl of the stand mixer, mix on low the whole milk, butter, whole egg, yolk, vanilla, and almond extract just until combined. Add the flour mixture to the egg mixture and mix on low speed until the dry ingredients are wet, then beat on high speed for 1 minute. Add the boiling water and mix on low speed just until combined. The batter will be very thin. Pour the batter into the three prepared cake pans, dividing it evenly. Put pans in the oven, two on the lower rack and one on the upper rack and bake for 12 minutes. Switch the pans and rotate them 180°, then bake for another 10 to 12 minutes, until a toothpick comes out clean. Watch the cakes carefully so that they do not dry out. Cool the cakes in the pans on a wire rack for 15 minutes. Run a thin knife around the edges of the cakes and then turn them out onto the wire rack. Carefully peel away the parchment and allow to cool completely. FILLING: Move top rack to the middle of the oven. Reduce oven temperature to 325°F. Spread the coconut in the rimmed baking sheet. Bake until golden, 12 to 18 minutes, stirring occasionally. Remove pan from oven. Pour the condensed milk into the 9-inch deep-dish pie plate and cover tightly with foil. Put the pie plate in the roasting pan and fill with hot water until the water reaches halfway up the pie plate. Bake for about 45 minutes, then add more hot water to the pan as necessary. Bake until the milk mixture is thick and brown, about 45 minutes more. Remove pie plate from water bath. Stir in the coconut, pecans, vanilla, and salt. Cover with foil and keep warm. GANACHE: (Make while the dulce de leche is baking.) Melt butter in the 3-quart saucepan. Turn off the heat and remove the pan. Stir in the corn syrup and chocolate until the chocolate is completely melted. Pour 1 cup of the ganache into the small bowl and chill for about 1 hour, until it is thick and spreadable. Keep the remaining ganache in the pan at room temperature. ASSEMBLE: Put 1 cake layer on the covered cake round and set it on a rack over a baking pan. Set a spatula in the cup of water. Drop half of the dulce de leche filling by spoonfuls evenly over the layer and gently spread with the wet spatula. Continue dipping the spatula in the water so that the filling spreads more easily. Add the next cake layer and top with the remaining dulce de leche filling, spreading the same way. Add the final cake layer and spread the chilled ganache evenly over the top and around the side of the cake. Warm the room temperature ganache over low heat, stirring, until glossy and pourable, about 1 minute. Pour the ganache over the top of the cake, making sure that it flows evenly over and around the sides. You can gently shake the rack to help distribute the ganache. Chill the cake in the refrigerator for 1 hour, them serve at room temperature. Keep any leftovers in the refrigerator. Oh my god, this is so sinfully delicious! Andrea, I love love your cake. German chocolate cake is my absolute favorite!! I definitely want to try this recipe out. A local bakery here used to make a German chocolate cake that had a layer of raspberry preserves in it – and wow – I’m so disappointed that they don’t sell it by the slice anymore!! Andrea, what a wonderful cake! Dulce de leche + coconut is a very used cake filling around here – they taste great together. Oh wow, I would like to have a BIG slice of that cake. With a tall glass of milk and good book = heaven. Mmmm, I love German Chocolate cake. Yours looks devine. 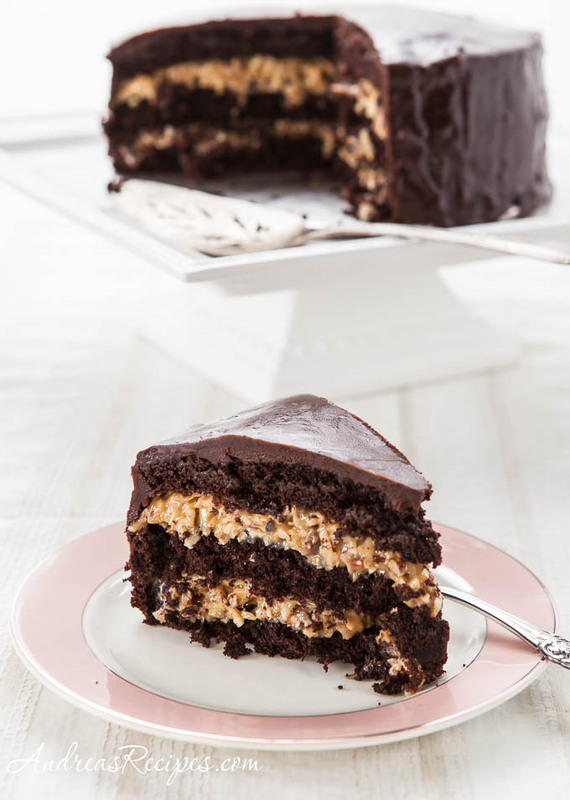 This is spectacular – I’m a big fan of German Chocolate Cake, and I love this new take on a classic! Hi Andrea! As Patricia mentioned dulce de leche and coconut are big here and I love any kind of dessert with condensed milk or dulce de leche. I cook it for 15 minutes in a pressure cooker filled with water (covering the can) and it turns out great. Oh boy, that last picture is killing me… it looks so delicious! This will be Sunday’s dessert…..
Just found your site – I Love it !!! Patricia, Amy, Cris: I’m with all of you…anything with dulce de leche is ok by me! I love everything about this cake: inside ot style, dulce de leche, soft and glossy ganache. Gorgeous. That first picture is stunning! What a clever thing to turn the German Chocolate cake inside out. That filling sounds sinful! I love ganache, especially with dark chocolate. Did the bittersweet work better than a semisweet? Love your photos, too. I’ve always loved my aunt’s German Chocolate Cake but I think I must try the dulce de leche now. Thanks for the twist on my favorite. holy smokes–that looks out of this world! 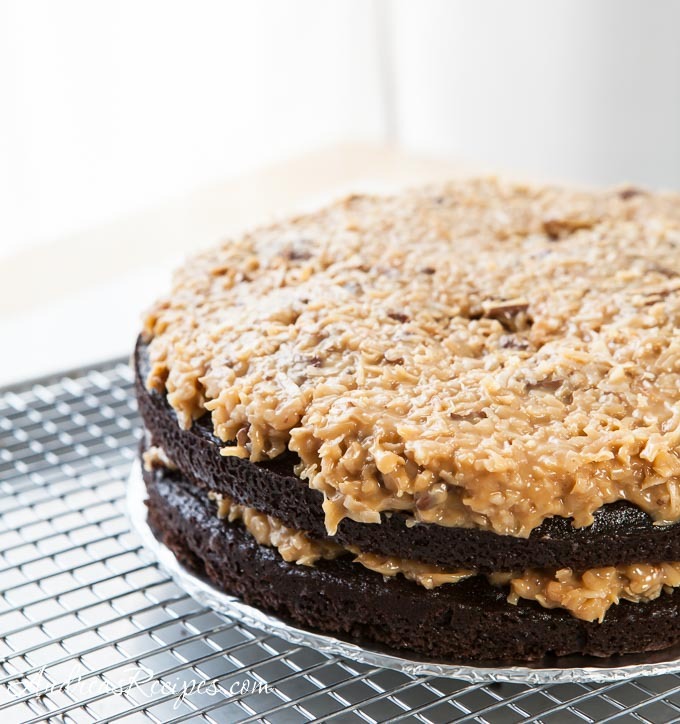 german chocolate cake is my all-time favorite dessert! Greetings from Singapore, I am just passing by. This choc cake is absolutely gorgeous, I want it for my birthday! YUM YUM YUM! I know what I’m making tomorrow! ooohhhlala! great idea for an inside out cake! hi!! wow! this looks fantastic! i`ll do my best and make it for my husband! any ideas on making this fabulous cake a cheesecake chocolate german cake? This is an older blog post, but since I’ve seen it quite a few times on pinterest, I thought I’d leave a comment. I made this last year for my husband’s birthday and he’ll no longer settle for anything less than this recipe! He says he can’t even imagine trying the store bought german chocolate mixes after having this cake. Love it and I’ll be making it again for his birthday next month! Hi Tami. I have not made this into cupcakes, but it would be easy to do. Each layer should yield about 12 cupcakes, so you would end up with about 36 cupcakes. Let me know how it turns out! The Kitchn has some good tips for converting cake recipes into cupcakes. I made them Friday night and they came out so good! I put the ganache on top and poked a hole in the middle of the cupcake so it made a filling and then put the filling on top and drizzled more ganache on top of that…my husband loved them!! I made them Friday night and they came out so good! I put the ganache on top and poked a hole in the middle of the cupcake so it made a filling and then put the filling on top and drizzled more ganache on top of that…everyone loved them! !